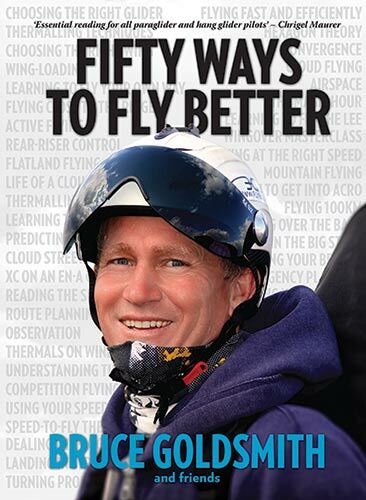 Fifty Ways to Fly Better is packed with the latest techniques and thinking from some of the world’s best pilots and instructors. With former Paragliding World Champion Bruce Goldsmith at the helm, the book draws on advice and knowledge from across the world of free flight. Essential reading for all paraglider and hang glider pilots, contributors include: Ian Blackmore, Josh Cohn, John Coutts, Bob Drury, Jonny Durand, Ed Ewing, Kelly Farina, Will Gadd, Ant Green, Steve Ham, Heike Hamann, Greg Hamerton, Alex Hofer, Marcus King, Patrick Laverty, Antoine Laurens, Horacio Llorens, Dustin Martin, Hugh Miller, Russell Ogden, Honza Rejmanek, Adrian Thomas, Jay Rebbeck, Raul Rodriguez, Jocky Sanderson, Pal Takats, Karel Vejchodsky, Godfrey Wenness and Rob Whittall. "Successful pilots often look like they get 'lucky', but it's just not true. To fly really well, you need to be 100% prepared. This book is essential reading for anyone wanting to fly at their best." "The closest a book can be to a personal coach or mentor." "Fifty concise chapters of varying length never bog down in theory or detail like a textbook. Any pilot of any skill level will find this book engrossing and learn something that would be useful to them ... it’s sure to make you a better pilot." Shipping costs are £1.95 for the UK, £2.95 for the rest of the world.